Updated 03-31-19. 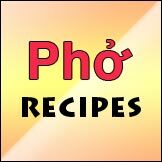 So you want to open your own pho restaurant. Well, you've come to the right place. 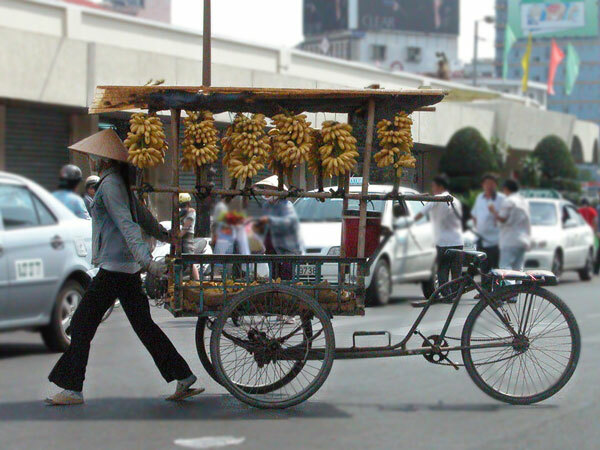 You can sell bananas, or you can sell pho, or anything else in between. But do you really have the desire to do this? Are you willing to do whatever required to get what you want? First let's get one important thing out of the way first. This "thing" is more important than anything that you'll do in your future pho restaurant. This "thing" is what you will need to keep your pho restaurant running. 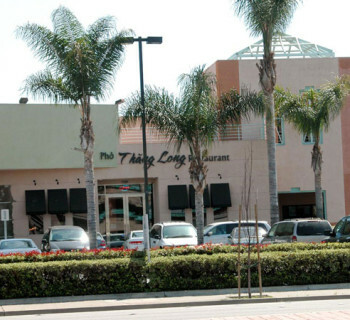 This "thing" is what you'll depend on when your pho restaurant is having a bad day. And it is what will give you that extra boost to the next level when your pho restaurant is having a great day. No it's not money. No it's not customers. It's not even your food quality or service. It's your desire to succeed. I know, I know. Cliché, right? You've heard this many times before; from friends, colleagues, inspirational speakers, advisors, TVs, radio programs, etc. So much so that it becomes meaningless, a cliché. But let me tell you from my experience (and many others' experience) from the trenches: as much as it sounds like a cliché, you will be thankful that you had it when you are least expected to need it. You'll appreciate its power even more when you realize that you've just pulled through a difficult situation due purely to your desire to succeed. You didn't give up. I'm not going to be preachy about how you want to run your business; I'll just tell it like it is. For those who still want to do it, we'll soon get to the nitty gritty, the mechanics, the down-and-dirty details, the how-tos, and the ins and outs. If you want to open your pho restaurant and are not willing to search through your inner self for and to understand the desire from within, then I would say you are not ready to run a restaurant. 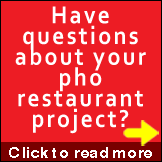 Your desire to succeed should be the first and last thing on your mind as a pho restaurateur. So, what are you getting into when you want to start your own pho restaurant? So you have some money/desire to open your own business. The question is why a restaurant, a pho restaurant. The retail business is tough. And restaurant business is even tougher. I won't bore you with statistics of restaurants start-ups and percentage of failure of new start-ups. And you can read all about how to start up a new business or restaurant from various available sources on the Internet. The fact is, on top of the various local, state and federal regulations you must follow, the products you sell in your restaurant, if you're not careful, can hurt and kill people. That's right. Your food if not prepared and served properly can make people sick and even die. On the other hand, for many successful restaurateurs, the satisfaction of seeing another human being enjoy your foods is extremely satisfying. Your desire to serve delicious pho to fill people's empty stomachs is the main reward. 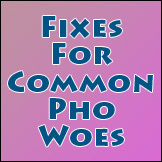 In any case, pho restaurant work is tough work before you get to the satisfying part, and the satisfying part can be immediate, several months, or several years down the road. Or it may never happen for a lot of operators. You want to make money. What money? Everyone has to eat, right? The reality is, with a lot of food competition all around, it's not easy to make a profit with a pho restaurant without discipline. If you're going to open in areas where Asian foods in general, and pho/Vietnamese foods in particular, are all happening, then you have to deal with competition pushing down your prices. If you're going to open in areas where you have no competition whatsoever, then you face higher labor and food costs, nonexistent suppliers, and unfamiliar customer base. 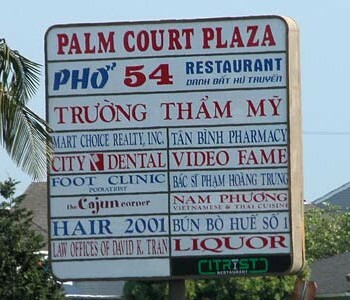 Either way, the reality is there and you must have a plan B and plan C for your pho restaurant. You need to be nimble to be able to quickly identify problems and find solutions to solve those problems. And by the way, you should count on trying to just survive some months (maybe more) before getting a return or even start earning anything. From my experience, these statements above are true for typical new owners. However, it's also true that many do succeed. For those with discipline, attention to detail, and strong desire and willingness to learn to do this no matter what, plus with the right guidance and planning, there is no reason why a new pho restaurant can't turn a profit on day one and continue to maintain profitability for the long term. It takes a special kind of operator to achieve this, and it is definitely achievable. Like everything else in life, it's not easy to create your pho restaurant concept to be new and unique anymore. Most everything has been tried by others already; a few make it through real hard work, and many failed due to complacency and ignorance of the basics, and due to poor execution. A lot of people have good to great ideas. But most do not execute well at all. It doesn't mean you can't find a little twist or two on existing concept and create your own. But your foundation has to be solid, and your execution must be tight and on target. If you are clearly aware of this fact when you start out, then you're already way ahead of your competition. So what are the basics? 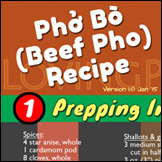 First off, your pho has to not just be pretty good, but also be easy and profitable (low-cost) to produce. After that, you must really desire to serve your customers. Finally, you need to run an effective marketing strategy to attract new and returning customers. Everything else follows from there. Together, it's called a well executed operation. I'll be discussing this in more detail in future posts. Whether you want to operate your pho restaurant the "mom-and-pop" style or a new trendy or even fusion style, you must create a pho restaurant that cares from within. 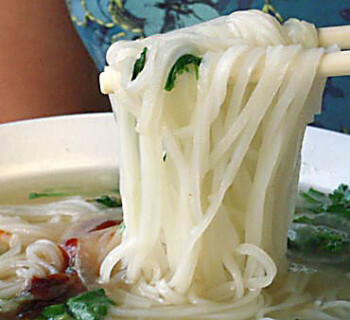 You may get by with just having the BEST pho in town, but that won't last too long. 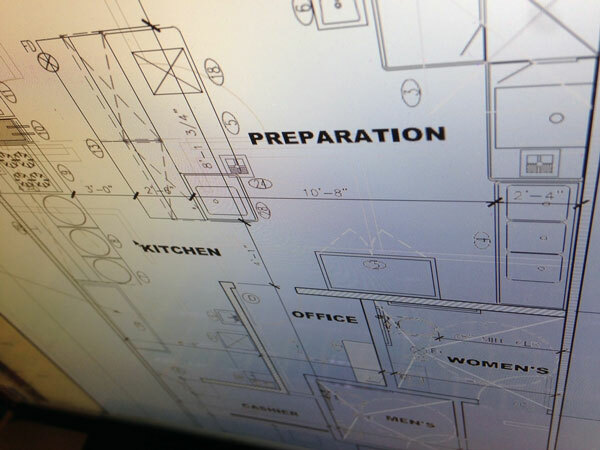 You'll have to build your pho restaurant like the successful restaurateurs do: through hard work and blood and sweat. Among the many things that can contribute to the success of your pho restaurant, the culture that you create for your organization will take you far when other areas fail. So don't skim in this area. Build a great culture of care and quality from within and from the beginning, and it will spread like wildfire, and your customers will line up outside your pho restaurant. So there you have it; a few important points to ponder as you think about opening your own pho restaurant. We haven't even discussed pho restaurant operation yet, but believe me, this is what will help make your pho restaurant venture a success. Without the desire to succeed, you'll quit or get frustrated at the littlest challenges that you will face everyday. Running a pho restaurant is not unlike running other restaurants. If you have the desire to succeed, then you are closer to a successful grand opening and smooth operation beyond that. This is running pho restaurant the Loving Pho way. The right way. By the way here's a poll on what readers consider the perfect pho restaurant. Restaurant owners new and old should take note of what customers are saying. If you haven't done so, please contribute your opinion by taking a vote. Take the top 3; great quality, cleanliness, good service; and ask yourself: what does it take to achieve these 3 from day one? The answers are as given above. 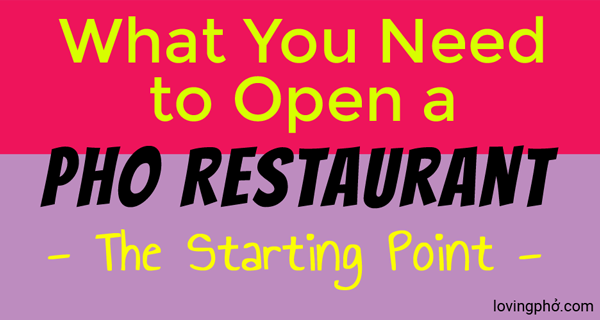 Next up: Tips For Your New Pho Restaurant's Front and Back of the House. Regardless of the type of restaurant, there will always be long hours and a lot of effort, certainly not a challenge for the faint hearthed! I’ve been doing a bit of research now, as my friend and I plan our escape of the corporate world and venture into the hospitality industry and I found some of this material pretty useful (https://www.silverchef.com.au/Getting-Started/Dummies-Book.aspx) thought i’ll share it with you, as it explains various elements I was not aware of. One last thing, you are completely right about ‘Caring for within’. Remember if you are just thinking about making a quick profit, you will struggle but if you are really happy with what you are doing, money will come! @William Rodrick: Thanks for sharing. From the look of the website, they are in the business to rent restaurant kitchen equipment, not to help you design, open and operate your new restaurant. Renting equipment is an option to fund a restaurant startup, and as always, cost benefit analysis needs to be done before jumping in, as this definitely has pros and cons associated with it. Offering a free book is a way to get leads for their rental business, and there is nothing wrong with doing it. The book itself, like many other books and online help sources, offers you general information like other “For Dummies” books do, and you can get out of it whatever you can get out of it. I hope you will find other sources that can help make your plan a reality, and best of luck with your search to follow your passion. Lastly, love your last statement. A successful restaurant owner is one who cares about what they do and loves to serve customers. Unfortunately many restaurateurs do not get this basic hospitality fundamental.